Special Task Force (STF) soldiers had assembled the tsunami refugees in the Mandaanai camp in Amparai district Tuesday morning and had told them that relief supplies the STF was planning to deliver to the camp will not be given as the LTTE had intimated that shelter residents do not like to receive hand outs from the STF. 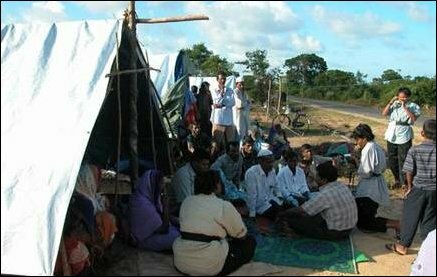 LTTE sources said STF personnel's calculated efforts to undermine the relief efforts by the LTTE is escalating tension in welfare centers in Amparai district. STF'a behavior is creating confusion among the welfare refugees, civil sources said. 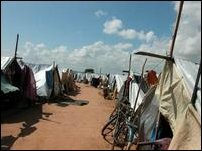 Displaced Muslim people from Pottikal village in Amparai are currently staying in a welfare center located in Oorani village. 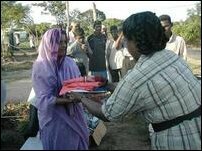 LTTE commander for Batticaloa-Amparai district Col Ram and LTTE Head of Women's Political Wing, Thamilini, visited the Oorani camp Tuesday and distributed clothes, lamps, cooking utensits and school supplies for the school going children in that camp. Representatives from the Sri Lanka Muslim Congress met with Col.Ram and Thamlini and had discussions on refugee issues.